It doesn’t matter whether you are an avid gamer, or the attraction of gaming in virtual reality is making you take the plunge. Gaming in virtual reality is a whole new experience. Though some of the most prominent titles on PlayStation and Xbox have yet to be morphed into virtual reality titles, there are many excellent and new games for your first foray into virtual reality gaming. There are some games which are difficult for software companies to develop into virtual reality versions. Firstly, person shooters, for example, take a lot of graphics, power, and control. In virtual reality, this would mean, firstly, a lot of work for the developers. Secondly, for the gamer, controlling a first-person shooter, especially with a headset, and head movement, might increase the chances of virtual reality motion sickness. Yes, it’s a thing! That said, the potential for virtual reality gaming is incredible. What we see right now is the development of simulation games, like flying, and space shooters, exploration and horror titles, and games which involve a lot of in character “walking”. “Experience” games like these we’ve mentioned, space, dinosaur worlds, horror titles, or activities like climbing or skiing are so much better in virtual reality gaming than on 2D gaming systems. Gaming in virtual reality uses a PC or console, and a virtual reality headset or head-mounted device (HMD). There are games you can play on a smartphone with a headset like Google Cardboard or Google Daydream, but they are not as good as the full technology headsets which work with computers and consoles. Virtual reality headsets display video and graphics provided by your console and computer. They are wired devices, as wireless virtual reality headsets are not available yet! When you are wearing a virtual reality headset each eye receives a separate image or video, the lenses reshape and focus each picture on creating your stereoscopic 3D image. Headsets mimic how our eyes work, and angle 2D images to each eye to create a 3D model and provide your 3D virtual environment. Facebooked owned Oculus have announced their first wireless virtual reality headset which will be ready for market early in 2018. It will be sold for around $199 so is also well priced for the new virtual reality gamer. A biosensor can read and react to nerve and muscle activity. Virtual reality developers are working on incorporating biosensors into virtual reality devices and virtual reality gaming. Biosensors could be attached to the skin or used in a full virtual reality body suit. Full suits are something we are likely to see as virtual reality develops. The problem right now with such suits is that they need to be created to fit the wearer’s body, as everybody is different. If the sensors don’t line up in the suits, the virtual experience won’t work. It’s the work of virtual reality game developers that is driving the innovation and quality of graphics, and sound, in virtual reality for other industries. Both the headset developers and the scientists and engineers who create virtual applications and technologies for other sectors, like healthcare and manufacturing, are taking the technological lead from the gaming developers. Software companies are under pressure to recreate the fast-paced 2D graphics in leading game titles, in upcoming 3D versions. It takes much longer to build virtual 3D spaces for games than the 2D versions we see on flat screen consoles and computers right now. Creating just one room in virtual reality can take programmers months of work. The virtual experience has to be perfect, not only for the gaming experience but also to limit virtual reality motion sickness. Our brains and bodies can react with nausea and other symptoms if we think we are moving in the wrong way. Cybersickness is a new term that’s increasing in use alongside virtual reality! Expected in the next few years, 3D internet will add further depth to virtual reality gaming, entertainment and experience. 3D internet will mean more interaction from companies and from the people we speak to across the net – think 3D social media! 3D internet will be a series of interconnected virtual worlds that users can visit by “teleporting” from one world to another. It’s the 3D graphics which will advent this kind of experience. It applies to virtual reality gaming too – what if we could play tennis with a friend in a virtual room across the net? 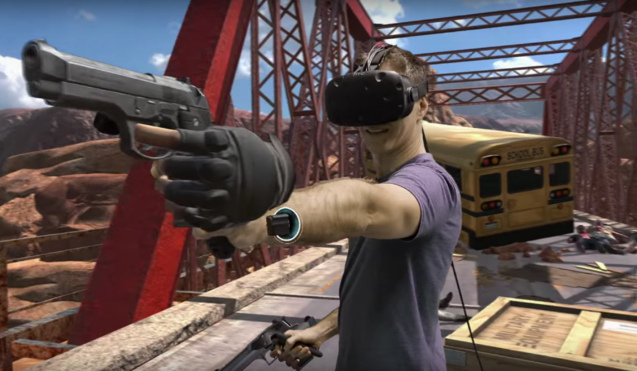 Two virtual reality gaming systems are leading the market right now. PlayStation 4 VR, which uses a PlayStation 4 console and a PlayStation VR headset. And, Oculus Rift which uses your computer. If you are using a computer, you need an excellent system and graphics card, or you are just not going to get the best virtual reality experience. The HTC Vive is also a major contender in the virtual reality gaming market right now; the Vive also uses a computer. We look at the PlayStation VR, Oculus Rift and HTC Vive in our Beginners Guide to virtual reality headsets for gaming. We know already Oculus is developing a reasonably priced wireless virtual reality headset. Who else is producing headsets for gaming? Okay so it’s not just for gaming, but it is a fantastic new development in virtual reality headsets. The Microsoft HoloLens is only available right now in a costly development edition. It’s the first self-contained, holographic computer. The HoloLens enables you to engage with your digital content and interact with holograms in the world around you. Find out a little more about the future of virtual reality, and virtual environments, in our previous article. The Razer OSVR is a little different. It’s a virtual reality headset built on the concept of OSVR – Open Source Virtual Reality. Everything about the platform is open and freely available. Its technology is not as sophisticated as other headsets, but it offers a well-priced DIY headset for serious virtual reality users. It also provides an opportunity for virtual reality hardware developers to advent their products, working with the Razer OSVR. Whether you are ready to take the leap into gaming in virtual reality right now, or you are waiting for the next excellent virtual reality gaming headset to hit the shelves before you make a purchase. Trying out some of the fantastic virtual reality games that are on the market right now is something to look forward to really! And if you have ordered your headset or console and are game shopping we found the best VR games in 2017 and the best virtual reality applications.